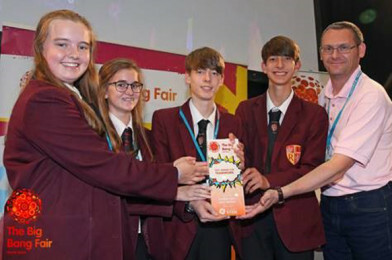 Conor McGinn MP recently visited Rainford High to meet talented students who won a national award in a global health and development competition. Four students in year 11, Zach Cunningham, Evan Cunningham, Rebecca Spencer and Katie Wilkinson came up with ‘Soap & Suds’ when they entered the Unilever Bright Future Programme in conjunction with All About STEM. Their concept, a bar of soap with a game inside, helps stop the spread of infectious diseases by encouraging children to wash their hands more frequently. 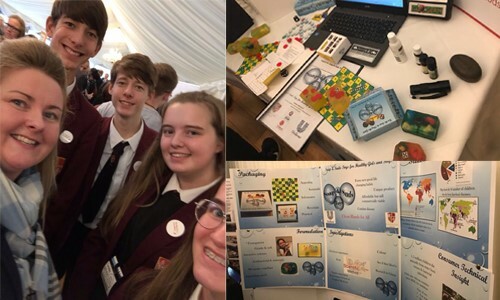 The Team entered their Bright Future project in the Big Bang UK Young Scientists & Engineers Competition at The Big Bang North West and won a place in the final at The Big Bang Fair in Birmingham. They then went on to enter the Youth Grand Challenges Competition and were crowned winners of the silver category! Following his visit, Conor McGinn MP contacted the Secretary of State for International Development, Rt Hon Penny Mordaunt MP, to highlight the project and ask her department to support it. The Youth Grand Challenges is a national STEM competition run by the British Science Association, that inspires young people, ages 11-19, to use science and technology to tackle global health issues. 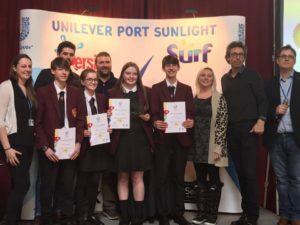 Previously he said: “The Unilever Bright Futures programme with All About STEM has proven to be an incredibly engaging way for students to learn more about the possibilities of STEM learning. As a school we’re always looking for ways to inspire our pupils and help them explore various areas of the curriculum outside of the classroom. I’m confident that this experience will have helped to inform our year 10 team and hopefully offered some insight into further study and career options.